One of a kind hand sculpted Koi! Although Alicia specializes in parrots, she receives many requests for Koi fish items as well. Each piece is handmade using different colors of polymer clay (no paint is used), to create a charming koi pin, necklace or earrings of your choice. The jewelry is formed without molds, so each piece is unique and ONE OF A KIND and cannot be exactly duplicated. 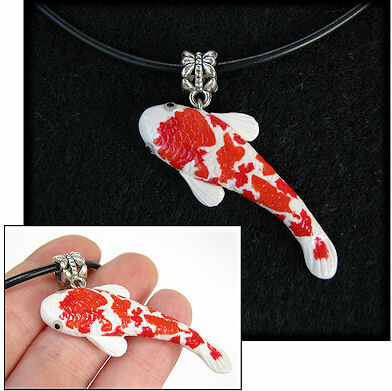 Each piece is custom made, and a picture of your specific koi will help to get a resemblance if you want to match a particular color/pattern. Great attention is taken with tiny details, such as individual scales, fins and eyes. Each piece is signed and dated on the back. Most pins and pendants range from one and a half to three inches in size. The items here are sold and shown as examples only. You may request a custom order here. Otherwise, you are welcome to check the Inventory for any Koi items which may currently be available. One of a kind CUSTOM Koi Pendant on silver toned bail, no cord included. 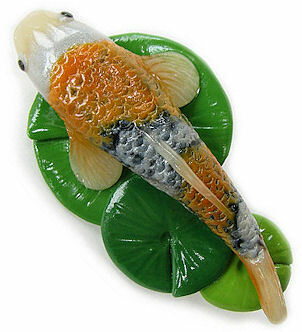 One of a kind CUSTOM Koi Pin, fish color of your choice on three green lily pads. One of a kind CUSTOM Koi Pendant on silver toned bail, strung on a black leather cord. Faux leather alternative is also available. 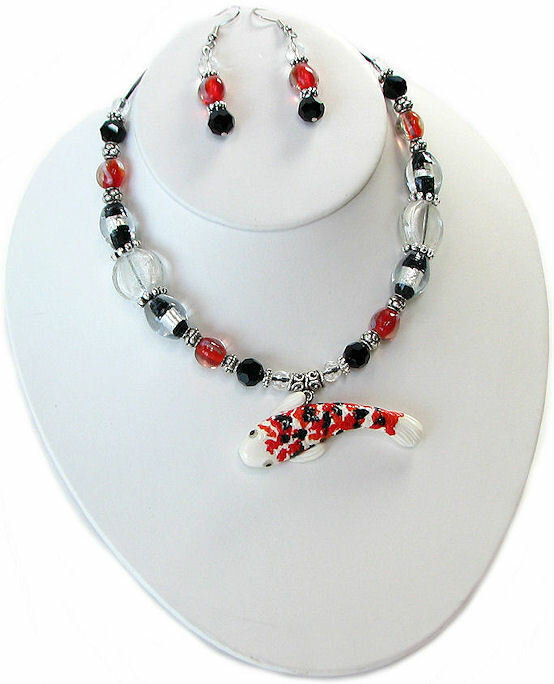 One of a kind CUSTOM Koi Pendant strung with glass beads on cord, with matching beaded dangle earrings. 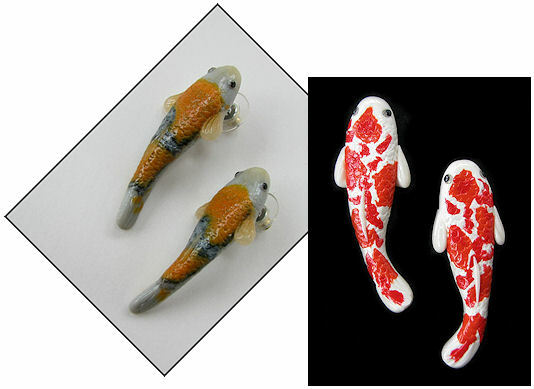 The custom koi earrings are very lightweight, since the polymer clay is not heavy. Each piece has a glossy finish, which gives the fish a "wet" look!